Flip Out Mama: Oh, My Sweet Babies. Did you guys see my sweet babies on Oprah? Okay, so not really my babies, but I love them just the same! I was sooo happy to see MJ's kids on Oprah yesterday! Oh, God, how they make my heart hurt. I can just look at them and start crying. I know, I'm a f*cking loser, but I love those kids. I am so proud of them and how far they have come! They are so grown up! These have got to be some of the strongest kids ever. I know how hard it is to lose your parents, and I can't imagine that on such a large scale. Bless their little hearts. I am so happy that they are finally going to private school, they seem to be enjoying it, and adjusting well. Their love for their daddy is so obvious in every word they speak, and it makes me happy that they know how much he loved them, and how much he tried to protect them. Oh God, when Paris talks about her daddy, my heart bleeds.I really still get teary every time I see these kids. I am proud of Katherine and Joe, for trying to give those kids a normal childhood, and for taking the huge responsibility that comes along with them. I hope to God that I do as good of a job with my children. 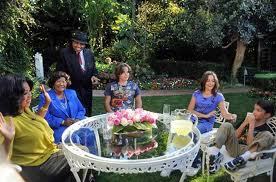 If you wanna more from the Oprah interview with the Jackson kids, you can find more info here.